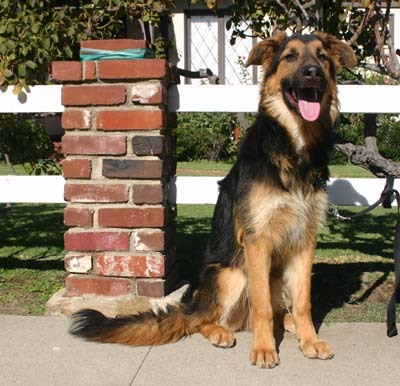 Franklin is an adorable 10-month-old German Shepherd with a touch of Golden Retriever. Franklin loves other dogs and loves the people he knows. Franklin's brother was adopted and Franklin was lost without him. Lucky Franklin is being sponsored at the Loved Dog Company, which is an off leash doggy daycare. Franklin gets picked up every morning at the boarding kennel and gets to go play all day and then gets back in the mini-van with the other dogs and gets dropped off back at the kennel. It is hysterical to see all the dogs sitting in their seats, waiting for their turn to get out. We somehow expect them to come home carrying their lunch box and homework. Franklin has also been treated to lessons with the on-sight trainer. So not only is Franklin the cutest kid around, he is going to be a very trained and cute kid.